As the boys watched football I got restless and decided to make a cake. 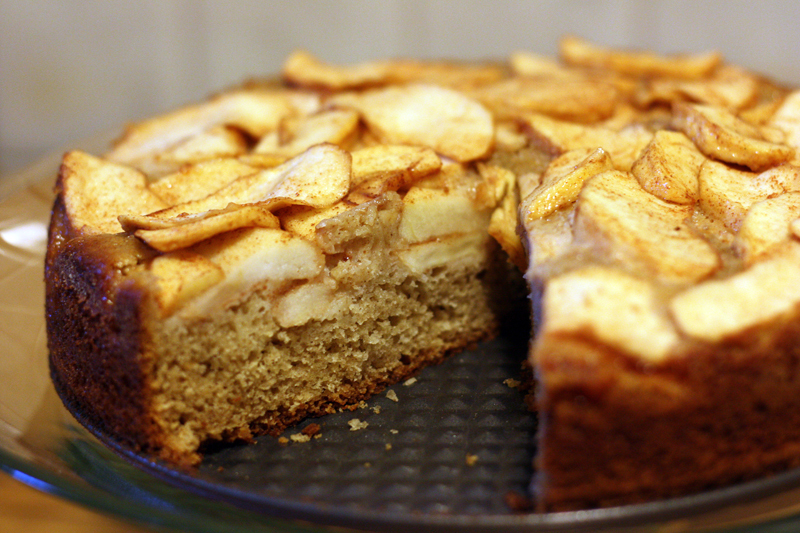 This is based on an almond apple cake that I made last year and wasn’t crazy about. I left out the almonds and added a good dose of cinnamon and homemade rum vanilla extract, and I think we finally have a winner! Preheat oven to 350°F. Butter and flour a 9 inch springform pan. Combine the apple slices, 1/4 cup sugar, and cinnamon. Stir to coat. Set aside. In a large bowl, stir together flour, sugar, baking powder, baking soda, salt, and spices. In a medium bowl, beat eggs. Add yogurt, butter and vanilla extract. Stir wet ingredients into the flour mixture just until combined. Pour the batter into prepared pan. Arrange apple slices over the batter, reserving the syrup that has collected in the bowl. Pour the reserved syrup evenly over the top. Bake for about 1 hour or until cake tester inserted in the center comes out clean. I wonder if this would work with slices of Italian Plums? I think I might have to give it a try – looks wonderful. I think it would probably be great with plums. Perhaps pears, nectarines, or peaches too. Let me know if you try it!